These posts update our girlfriends on current projects and meetings. Please join us for our very first Girlfriends Care meeting focusing on the local trafficking issue in San Diego County! Kyle Moss, co-founder of The Alabaster Jar Project, will be joining us to share how Alabaster Jar helps with healing the survivors of those able to escape right here in our communities. WHAT: Girlfriends Care Casual Brunch Meeting. Dress is Saturday Casual! WHERE: Get Smart WorkSpaces, 2888 Loker Ave East, Ste 111, Carlsbad, 92010. WHY: Meet Alabaster Jar and learn more about our smorgasbord of outreach from which to choose as you enjoy the company of friends! HOW: RSVP NOW to RSVPNC@girlfriendscare.org AND let us know if you’d like to bring a brunch dish to share. Be sure to bring a friend or two! The Alabaster Jar Project will be joining us at our meeting – and has indicated that if anyone attending wanted to bring packages of ladies underwear (all sizes) with them, they would be happy to take them back to the ladies at the safe house with them. Come enjoy a free brunch with your Girlfriends and learn about how Milestone House helps at-risk foster teen girls through their trauma towards leading a safe and productive life. Learn about their programs, including their Milestone House Program of Services for emancipated foster youth called Fostering Adulthood Jobs Network, a social enterprise which creates companies under the non-profit that offer foster youth opportunities for employment by developing products or providing services. WHY: Meet Milestone House and learn more about our smorgasbord of outreach from which to choose as you enjoy the company of friends! Check back with us soon to see how you can help the girls at Milestone House. Not in your budget – no problem! Come join us and share a rewarding time with your girlfriends. See It All Come Together! Let’s wrap up our food drive for homeless kids and meet where the magic happens! Join us for our February meeting of Girlfriends Care featuring Got Your Back San Diego – and see how your food donations get sorted, organized, counted and placed in backpacks for the kids – and hear how it all works as we feature Got Your Back San Diego. We will also give you a sneak preview of our plans for 2019, including featuring some of our newer projects and success stories you may want to join! 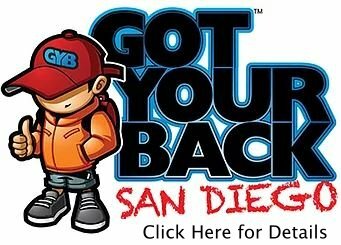 WHY: Learn more about Got Your Back San Diego, an amazing organization that fills backpacks weekly to feed children attending SD County schools who have been identified as homeless and/or food insecure. Tax-deductible receipts available upon request! Please join us for a casual San Diego GFC Brunch meeting. We will be highlighting our non-profit partner Just in Time for Foster Youth. Just in Time for Foster Youth helps mentor, guide and support emancipated foster youth to successfully transition into independence. We will learn more about this organization and the services they provide. WHY: Meet Ivan Chavez, Volunteer Services Coordinator for Just In Time (and a former foster youth) and learn more about this amazing organization as you enjoy the company of friends! HOW: RSVP NOW to RSVPSD@girlfriendscare.org AND let us know if you’d like to bring a brunch dish to share. Be sure to bring a friend or two! WANT TO HELP? Help a JIT Youth get a fresh start by participating in our “My First Home” drive. We are collecting the items below to help transitioning foster youth with basic needs to set up and maintain a clean, fresh home. Help us “Collect a Grand of Food” to Feed the Children! That’s 1,000 items of nutrition for Got Your Back San Diego to help in the local fight against childhood hunger! Can we do it? You might organize a family project, or include your school, church, neighbors or work group in this project to feed the children! GYBSD helps children who are technically homeless through a weekend nutritional program that provides food in backpacks through the local schools! AND HELP A CHILD GET THE RIGHT START TO THEIR DAY! Click here for a flyer to use for your own drive. Donated food items not included on this list will be distributed to other organizations in need. DELIVER TO ANY DROP SITE DURING THE MONTH OF JANUARY! Tax deductible receipt available upon request. To find a drop-off location nearest you or to be a drop-off location, please contact us at info@girlfriendscare.org. HERE ARE SOME CURRENT OUTREACH PROJECTS THAT MAY HAVE YOUR NAME ON THEM! Contact Info@girlfriends.org for more information or to sign up! Boys and Girls Club Vista – Contact Ellen Clark at ellen@bgcvista.com. Adopt A Family at the Boys and Girls Club of Vista and help make the holidays magical! Looking for 3-4 girlfriends to “share” a family. Grandmas Care Winter Project – Grandmas, we are collecting hats, scarfs, gloves for Christmas through December 15th. Please email Rosita for details. Got Your Back San Diego – Next month Girlfriends Care will be collecting breakfast foods for children in need in San Diego. Help us collected 1,000 items by starting your own food drive, encouraging friends to bring an item to your next holiday party, or collected food at your place of business.Click here for a flyer to use for your own drive. Bread of Life – Love to cook? Girlfriends care prepares and serves dinner to the guests of Bread of Life Rescue mission the first Saturday of the month during their winter shelter season. To participate contact Maureen Richards maureen@girlfrienscare.org This is a family friendly service project. A limited number of kids and teens welcome. GFC Gift Bags for women in need– Supplies are needed to fill GFC Gift Bags. A beautiful gift bag brings a smile to those with very little. Girlfriends Care decorates and puts together gifts bags for women and girls in need, We need new journals, beauty items, jewelry and other “girly” items to fill the bags. Contact Diana Hanes at Diana@girlfriendscare.org if you would like to donate or bring them to a monthly meeting. Prayer Pillowcases – Girlfriends are needed to help cut, iron and sew our Prayer Pillowcases in preparation for the distribution of more than 700 pillowcases each year to comfort the homeless and those living in transitional housing in both North County and San Diego. Girlfriends are also needed to lead groups of kids decorating and praying for the receiver. Contact Linda Crawford at pillowcases@girlfriendscare.org for more information and/or to make a project donation. Homeless Street Teens and Foster Youth Aging out of the system – Donate non-perishable snacks or socks to be handed out to the homeless teens through YMCA Youth & Family Services. Bring to the next Girlfriends Care meeting or drop off at any of our drop off locations or contact Charity at CBrant@ymca.org. Milestone House, Support At-Risk Teen Foster Girls! Milestone House is in need of volunteers who are willing to share their teaching talents in areas needed – such as music, art or cooking. Contact Beverly Boone at Beverly@milestonehouse.org. Help Women and Children Rebuilding Their Lives After Domestic Violence or Sexual Assault – The moms and children living in transitional housing at the Women’s Resource Center always need basic household supplies and grocery store gift cards. Drop your donation during regular business hours at their office at 1963 Apple Street, Oceanside 92054 – or bring to a GFC meeting. Brother Benno’s– Volunteers are always needed at both the main center and the Thrift Shop. Contact Denise Seymour at denise@artistofyourmind.com. The Thrift shop is in needed of clothing donations. Drop off at the Thrift Shop or contact parsons7016@sbcglobal.net. Bread of Life– Serving neighbors without homes in North County. Volunteers are needed for various projects. To find out more go to website bolrescue.org or contact bolrescue@gmail.com. Donations of food and paper products are in need! Fill A Belly welcomes families, small groups and individuals to bring, serve and enjoy dinner with guests on Tuesday evenings at Holiday Park in Carlsbad. KidzCare– Hands-on kid sized outreach projects for kids age K-8th grade are great teaching tools! Contact Sharon at KidzCare@girlfriendscare.org for more information or to sign up. Teens Care for ages 13-19 is designed to provide meaningful volunteer opportunities for youth. Projects can count towards community service hours required by local schools. For more info or to get on the mailing list, contact Ellen at TeensCare@girlfriendscare.org. “GFC Breakfast Club”: Help feed the poor and homeless at Brother Benno’s on the 3rd Saturday of each month (except December). Arrive at 9:30 AM and finish by Noon! The food, which is supplied and prepared by Brother Benno’s, is served from a cafeteria-type line. If you want to serve, or just to put your name on the Serving Roster to be notified for future months, please let us know at Info@girlfriends.org Ages 17 thru 107 are welcome! Amazon-SMILE is a simple and automatic way for you to support Girlfriends Care every time you shop, at no cost to you. When you shop, AmazonSmile donates 0.5% of the price of your eligible purchases to Girlfriends Care. Simply choose AmazonSmile and Girlfriends Care, then place your order as usual. Share this with your friends, relatives, college students ordering their books, etc., so we can “Compound the Caring” for all those we serve! AmazonSmile: You shop. Amazon gives. Another Win-Win-Win! 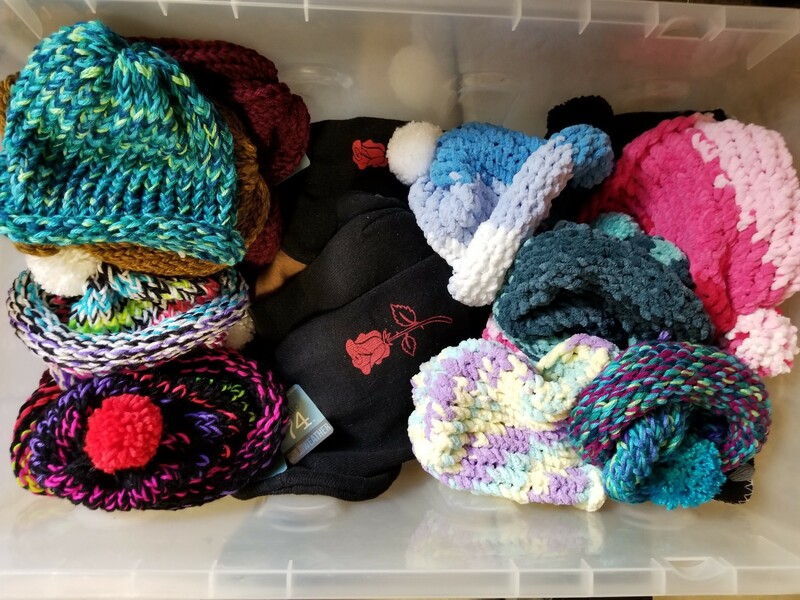 Grandmas Care, as our Winter Project, is collecting knitted hats/beanies and scarves for homeless children and women in transition. Help us meet our goal of 100 knitted hats/beanies and 100 knitted scarves by December 15th. Contact Rosita@GirlfriendsCare.org for more information or for details on dropping off hats/scarves. Girlfriends Care, KidzCare, Teens Care and Guys Care Too! It’s time to sign up for one of our most popular events of the year in support of Brother Bennos…. Volunteers are needed to help the homeless, working poor, and those in transition who are served by Brother Benno’s! Guys, Teens and school-aged Kids are welcome too! Join us for Second Saturday Brunch featuring Operation Hope. Operation Hope could really use pillows, towels and washcloths. Drawings, Shopping and maybe you’ll want to enjoy lunch too! Volunteers are needed the day before the event to help get things set up. Sign up here. GFC ambassadors are needed for 2 hours shifts on the day of the event to greet participants, share what Girlfriends Care does, and assist in the collection of donated items. Sign up here. Join us at the event and/or donate one of the following items below to help the hungry, the homeless and the hurting for the holidays! Tax deductible receipts available upon request. Please come to Care & Share with us!